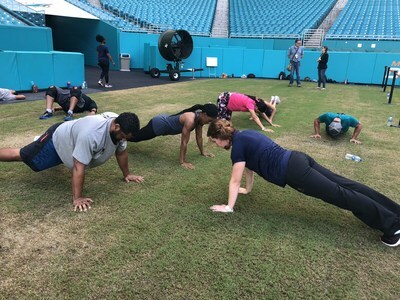 MIAMI, Nov. 5, 2018 /PRNewswire/ -- The Miami Dolphins hosted local Wounded Warrior Project® (WWP) warriors at Hard Rock Stadium for a fitness and nutrition activity that marked the veterans charity's 15 years of service. The event was one of 20 others conducted across the country through the WWP Physical Health and Wellness program, designed to reduce stress, combat depression, and promote an overall healthy and active lifestyle. "More and more, injured veterans are incorporating adaptive workouts into their recuperation process," said Angela Hemmen, WWP Physical Health & Wellness regional director. Angela was the on-site coach who demonstrated proper techniques for the exercises. There is a reason for this movement among the wounded veteran community. In a WWP survey (https://www.woundedwarriorproject.org/survey) of the warriors it serves, 30.3 percent of survey respondents expressed physical activity helps them cope with stress and emotional concerns. "This was a fun activity that allowed warriors to get out of their houses and got them active and connected with fellow veterans as they explored exercise and nutrition," said Angela. "Wounded Warrior Project offers a selection of health and wellness clinics across the nation – some are even available in the comfort of a warrior's home. Thanks to generous supporters, we are able to offer these programs free of charge to registered warriors." As a long-time supporter of WWP, the Miami Dolphins have hosted these clinics at their stadium and have raised awareness through various campaigns including Salute to Service and My Cause My Cleats. The "15 Years of Service" fitness activity incorporated a format known as AMRAP or "as many reps as possible" that helps build intensity, conditioning, endurance, and mental toughness into each workout. The physical exercise lasted approximately 60 minutes and included: 10- to 15-minute movement prep warm-up; 15-minute AMRAP; 5- to 10-minute cool down; and a 15-minute nutritious meal provided by the Miami Dolphins. Learn about WWP's other free wellness opportunities, in-person and online classes, coaching, and health clinics for warriors and caregivers at https://www.woundedwarriorproject.org/programs/physical-health-wellness.